Mobile devices have become one of the most common ways Americans get news, outpacing desktop or laptop computers. Roughly six-in-ten U.S. adults (58%) often get news on a mobile device, 19 percentage points higher than the 39% who often get news on a desktop or laptop computer, according to a Pew Research Center survey. The share of Americans who often get news on a mobile device is nearly triple the 21% who did so in 2013. At the same time, the portion of Americans who often get news on a desktop has remained relatively stable, with 39% of adults often getting news on a desktop or laptop computer, up just 4 percentage points from 2013. The portion of adults who ever get news on a computer – as opposed to often get news – is about the same as those who ever do so on a mobile device – 88% of Americans ever get news on a mobile device and 84% ever get news on a computer. 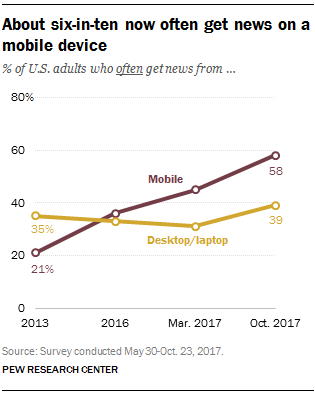 Overall, 96% of U.S. adults get news online – i.e., ever get news on either a mobile device or computer. The growth in mobile news consumption has been driven by older adults and those with lower incomes, as previous analysis has shown. Young people, however, still outpace their elders. About seven-in-ten adults ages 18 to 29 (71%) often get news on a mobile device, compared with 37% of those ages 65 or older. Moreover, those 65 and older are still more likely to often get news on a desktop than on a mobile device (47% compared with 37%, respectively). This is the only age group more likely to get news on a desktop or laptop computer than on a mobile device. Race and partisanship also play a role in mobile news use. Nonwhites and Democrats and Democratic-leaning independents are more likely than their counterparts to get news on a mobile device, and are less likely to do so on a desktop or laptop. About six-in-ten nonwhites (61%) often get news on a mobile device, compared with 56% of whites. The opposite is true when it comes to getting news on desktop or laptop (31% among nonwhites vs. 44% of whites). Roughly six-in-ten Democrats and Democratic-leaning independents (62%) often get news on a mobile device, compared with 54% of Republicans and Republican leaners. This pattern is reversed for desktop news use: 43% of Republicans often get news on a desktop or laptop computer, compared with 38% of Democrats. Those with more formal education and higher incomes are more likely to get news on both mobile and desktop or laptop. Those with a college degree are more likely to often get news on mobile than those without a college degree (66% vs. 51%). The same pattern holds for desktop and laptop news users. Men are also more likely than women to often get news on both mobile (60% vs. 56%) and desktop. Note: This survey was conducted through Pew Research Center’s American Trends Panel, a nationally representative panel of randomly selected U.S. adults. The field period was from May 30-Oct. 23, 2017, on an American Trends Panel Refresh Survey, which requires a longer field period. See full topline results and methodology here (PDF). Sophia Fedeli is a research assistant focusing on journalism research at Pew Research Center.